I have not been taking pictures as frequently. I pull out the camera when I see something I want to capture, but not just to get a picture. Maybe I'll do better soon, but the motivation has left me! This is for the week of September 25 - October 1. Sunday: I did not take any pictures on the Lord's Day. I am thankful for a day where we can have a change of pace and learn more about God. Tuesday: I didn't take a picture on Tuesday. This picture is from Thursday. 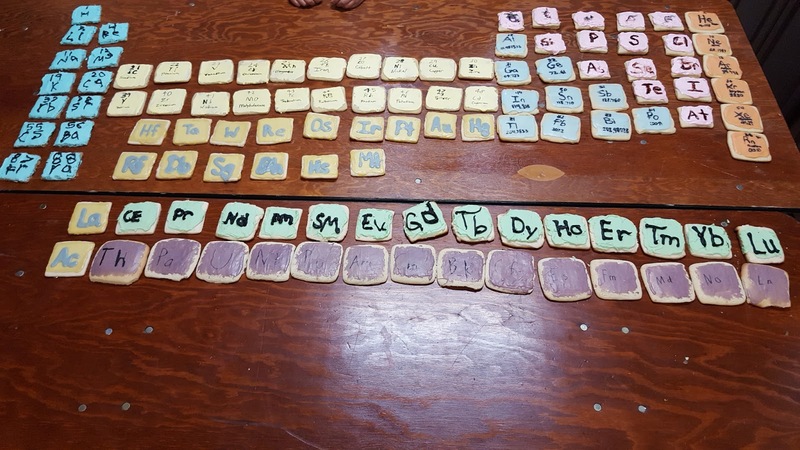 The Junior Chemistry class made a periodic table from sugar cookies! It was a more difficult project than it probably should have been, but the results were tasty nonetheless! 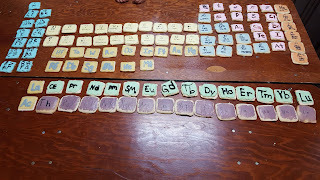 I am thankful for Michelle teaching Chemistry to the kids and doing all the experiments and projects to go along with it. Wednesday: I bought Kyle a VCR from Goodwill for him to take apart. He loved figuring out how to take the case off. Then he took some springs off and watched to see if it would work. He couldn't get too much further, but he enjoyed the process. I am thankful for Kyle's desire to learn and explore. I am not sure how to further that desire, but I try where I can. Thursday: I teach two critical thinking classes at the co-op at our church. I love the material and I try to make the class exciting for all the kids. We play games and try to solve problems! Kyle is playing with a geoboard. I am thankful for the opportunity to teach some of the kids from our church. Friday:We got pool noodles to turn them into swords! Patrick loves carrying one around and hitting the ground. I call him my little warrior! I am thankful for the kids' imagination and creativity in their play. Saturday: Kyle tried to make a sling out of duck tape, but it didn't work very well. We looked online and found several tutorials on how to make a sling from paracord. We bought the paracord, and Kyle made a jig and then wove his very own sling. He practiced with it and decided he needed a bigger cup in it, so later he modified the jig and made another sling! I am thankful for Kyle's desire to work hard at what he wants!